There must be many contenders for the best railway journey in Britain. The Settle to Carlisle line will surely be the one mentioned by most, however the mainline through Devon and Cornwall has to be a major contender. However for me, there can be only one. It’s the West Highland Line from Fort William, and for me, there’s only one way to do it. 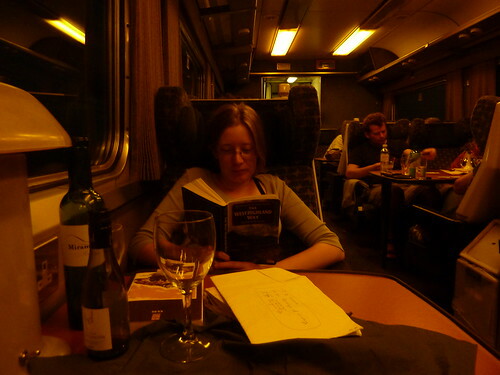 The Caledonian Sleeper. Back in June we’d arrived in Fort William having just completed the West Highland Way and gone up Ben Nevis for good measure. For various reasons, I never got round to doing a series of blog posts about it at the time, although the story is told in photographic form over in my West Highland Way photograph collection. We had a great time – lovely weather, lovely scenery, and a wee dram or two. However after coming down from Ben Nevis, we had to head back down south. It’s a long way Fort William to London, however it is on the Caledonian Sleeper and is the longest journey the sleeper operates. It even has its own, unofficial, name – The Deerstalker. So, after a nice shower in the excellent facilities at Fort William station, we boarded our train south. Now if you’ve read any of my posts on the Caledonian Sleeper (and man, there have been a few) you’ll know that the first thing you do after boarding the Sleeper is pop to the lounge car and settle down there to enjoy the most excellent beer and whisky collection. And in the case of the Deer Stalker, enjoy the view. The train leaves Fort William around 7pm so we had lots of time to sit back and enjoy the scenery – and the West Highland Line does go through some totally amazing scenery. Soon after leaving Fort William we were in wilderness and moorland as the line makes its way slowly through Rannoch Moor. Remote is perhaps an understatement for this line – most of the stations serve very small communities. Every time we pulled into a remote looking station, we couldn’t help but look out on the platform and wonder where all the people had come from, especially as many stations seem to sit completely in the middle of nowhere. At Corrour station about ten people boarded, yet this is a station that sits in the middle of nowhere and doesn’t even have road access. Looking around the area there was little to see bar the Moor and the station. Those boarding were mostly walkers, no doubt of that. However, despite being a sleeper service, the Deer Stalker can also be used as a local service, although officially seats need to be reserved. But what a local service to use. As we trundled through Rannoch Moor too, we were greeted by sights of two deer standing dramatically on the moor – half an hour later this excitement was surpassed in even more spectacular fashion by the sight of a large group of deer gracefully leaping. Leaving the moor behind, we were greated to a “West Highland Way Greatest Hits” where the train follows the mighty hills and mountains we’d walked near for the last few days before arriving at Loch Lomand. As we finally left the Way and the route pulled off towards Glasgow, the sun began to set and darkness came down. Later on we came alongside another loch, illuminated by houses and lights twinkling some miles away. In the daylight, this is a stunning journey and has to be up there as a contender. However doing it on the sleeper enables the traveller to do it in pure style. There’s nothing like sitting back in the lounge car (ours was clearly an old Intercity first class carriage rather than the bar style ones normally used), eating a meal and drinking a few pints of ale, followed by a cheese plate and a whisky or two, whilst watching the world go by. And when the view has gone, settling down with a good book. Okay, it’s not the Orient Express, however there’s no sleeper train quite like the Deer Stalker for providing a journey and a half. True, arriving in London the next day is a bit of a let down. But what an evening to have before. This journey is a true gem and if it’s not the best railway journey in Britain, then I don’t know what is.